Young Women With Breast Cancer Opting For Mastectomy : Shots - Health News Mastectomies have become increasingly popular for women with breast cancer. That's a big turnaround from the 1980s, when women abandoned mastectomy in favor of breast-saving lumpectomy. 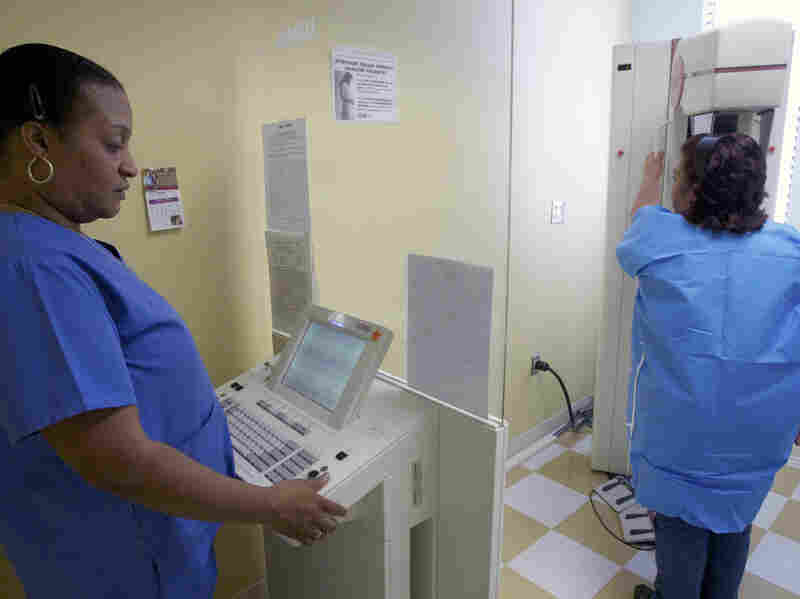 Toborcia Bedgood performs a mammogram to screen for breast cancer at the Elizabeth Center for Cancer Detection in Los Angeles in 2010. These findings will be presented Monday at the American Society Clinical Oncology's annual meeting in Chicago. The research involved 227 Massachusetts women and may not be nationally representative. But study authors say it's in line with other studies suggesting that many of today's breast cancer patients are choosing mastectomy. Sixty-two percent of women 40 and younger in this study opted for mastectomy. One in seven breast cancer patients falls in this age group. That's in sharp contrast to their mothers' generation, which saw the rise of lumpectomies in reaction to a belief that mastectomies were unnecessarily traumatic and disfiguring — and mounting evidence that lumpectomies resulted in equivalent survival. The new research also documents a growing trend toward prophylactic mastectomy — removal of a noncancerous breast after discovering breast cancer in the other one. In 1998, fewer than 2 percent of women with breast cancer chose this option. In the new study, 37 percent chose prophylactic mastectomy in the non-cancerous breast. And, considering just women who chose mastectomy at all, more than 60 percent had prophylactic removal of the noncancerous breast. All the women in the study had been diagnosed with stage I, II and II breast cancer. The study did not look at women with a so-called stage-zero condition called DCIS, short for ductal carcinoma in situ. The study also didn't include women breast cancer affected both breasts or had metastasized to other organs. "There's no difference in survival" between mastectomy and lumpectomy among women with stage I, II or III breast cancer," study author Shoshana Rosenberg tells Shots. "These are women who had a choice, and 62 percent chose mastectomy." She and her colleagues at Dana Farber Cancer Institute and other institutions are trying to understand why. Some of the reasons they uncovered are clear and supported by data. Others are less so. For instance, women who have a mutation in one of the genes called BRCA were much more likely to choose mastectomy or double mastectomy. That fits with evidence that they have a very high lifetime risk of cancer recurrence. But women who had a mother or sister with breast cancer were no more likely to choose mastectomy. Rosenbergsays the study didn't find younger women choosing lumpectomy because of concerns about body image. "You would expect that to bias them toward breast-conserving surgery," she says. But clearly, among women in this study, that's not the case. "From our perspective, the most interesting finding is that role that anxiety plays in the decision,"Rosenberg says. Women who scored high on a standard test for anxiety were more likely to choose mastectomy. This makes her worry that women anxious about the best choice "are not necessarily contextualizing their true risk – not understanding or not knowing – because there's no difference in survival, so it really shouldn't make a difference which surgery to choose." Another clue to whether women are aware of the survival data: Those who say they made the decision themselves, rather than sharing the decision with their doctor, were more likely to choose mastectomy. "If they're making this decision on their own, it's hard to really know if they know all the facts and interpreting the risks accurately,"Rosenberg says. "We've done some other research indicating that women overestimate their risks" of cancer recurrence or death. The study also finds that women were more likely to choose mastectomy if they had a tumor that's Her2-positive, if their cancer had spread to nearby lymph nodes, if they had two or more children, and if they were leaner. That last factor probably reflects the fact that some heavier women aren't good candidates for breast reconstruction surgery, so they're more likely to choose lumpectomy. But the study doesn't answer other questions about mastectomy-vs.-lumpectomy that may factor into many women's decisions. For instance, some women may be concerned that they'll get a poorer cosmetic result from lumpectomy and radiation than from mastectomy followed by reconstruction. The study doesn't address that, or concern about the side-effects or burden of weeks-long radiation treatments that usually follow lumpectomy. The study also doesn't address economic issues — such as the cost of one procedure versus another, or whether it makes a difference if women have insurance coverage. Rosenberg says the point isn't to question whether many younger women who choose mastectomy are misguided. "It's a high rate of mastectomy, but we're not trying to say women who choose mastectomy are making a bad decision," she says. "We just want to make sure it's an informed decision. You want to make sure the patient understands the benefits and harms of each option."